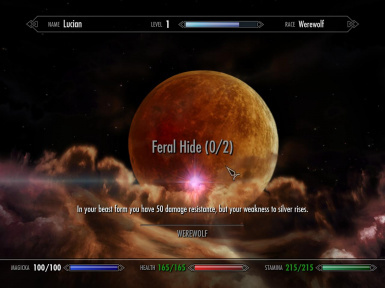 This mod is designed to offer the players maximum werewolf experience. 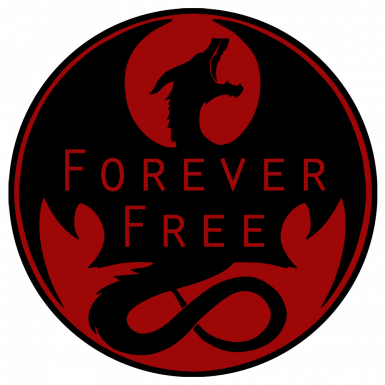 Its design is to offer more immersion with Moonlight Tales and also offers more survivability on higher game difficulties and also with mods that improve difficulty such as SkyRE, Deadly Dragons and simmilar. Fixed Feral Endurance Perk the HealRateMult didnt proc as it should. Bloodmoon Rising is now also on SSE nexus! Bloodmoon Rising is fully compatible with Moonlight Tales editions that do not add perk tree! For the love of holy cow, please read description! Recommandation by author how to use the mod! 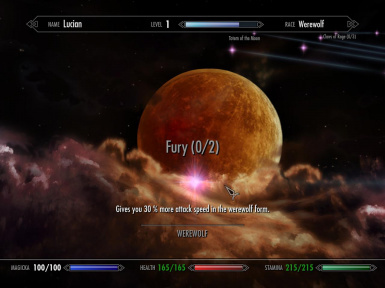 AS some of you already know i designed this mod primarly for players on lvl 30 + who play on either Master Level Difficulty or Legendary difficulty. I'll release the Lite version of the mod also after the new 4.0 version, so stay tuned. More about Normal version and Lite version is described in this description. 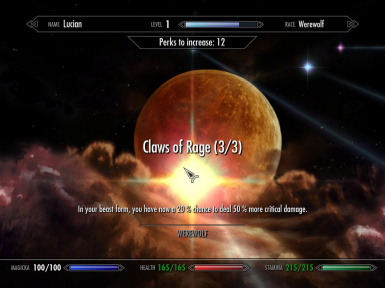 With this setting Bloodmoon Rising really starts to "shine", not only it gives you survivability but good damage output. With this mod things get a little harder, use tactics to avoid enemy attacks, altough Bloodmoon Rising still scales very good with SkyRE combat and enemy AI. 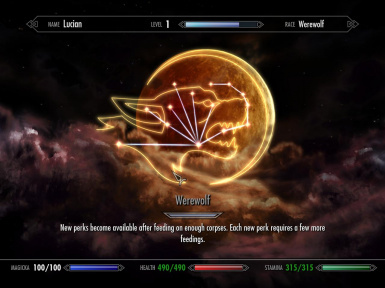 Since SkyRE changes Fortify Unarmed Damage (werewolf fortify unarmed damage is excluded by SkyRE), the WerewolfImmunity (Werewolf BLood), will give you 40 % reflect damage except Fortify Unarmed Damage, which is low but useful. Im playing with all those settings + SkyRE, the game is very hard in human form, but in werewolf form slightly easier but still chalanging. 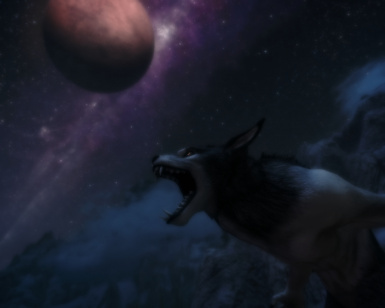 This mod is now as it should be since i wasnt satisfied with the first release so i hope you will be satisfied with this new release, this mod is continiuation of the mod by Xahstur ToL Werewolf Overhaul The Call Of The Bloodmoon. Also dont forget to endorse it keeps me motivated to continue working on this mod. Ty! "With the rank of the Moonborn, you have just started to understand the werewolf curse and with it you gained minor increase in health and stamina.Hunt under the moons to evolve further. When Hircine is pleased he will grant you with another werewolf rank." This Perk is available to you when you gain Werewolf Blood and its automatically gained to the player. 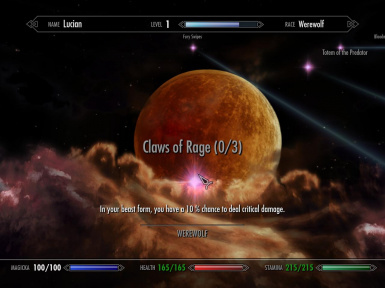 "After spending time in your werewolf form and hunting under the moons, you now understand your condition and accepted the beast within.The rank of Werewolf Brute gives you increased damage and increased health and stamina in your werewolf form." "Spending long time with the inner beast, you've reached Werewolf Elder rank. You gain immunity to Iron and Steel weapons, increased damage, health and stamina." "Werewolf blood in your system grants you rapid health regeneration and stamina regeneration, both in human and werewolf form." 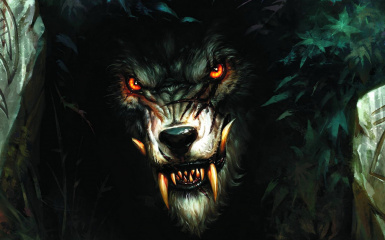 "Werewolf form has its pros and cons, but werewolves are known for their tough hide in combat against most of the attacks. But, your weakness to silver is your bane, kill them fast or they will kill you." 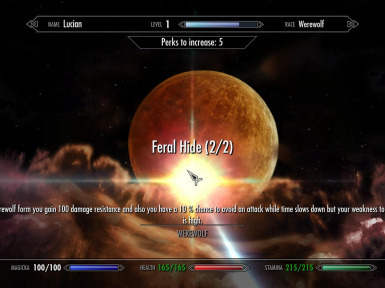 "When Hircine is pleased with your hunting endevours, you gained his own hide and prowess in combat, thus your defence against most of the attacks has increased and you gain ability to quickly evade the attacks while time slowes down.This comes at a cost because you're now even more vulnerable to silver weapons." Time slows down during enemies normal/power attack for 2 seconds, this ability will help you to evade those attacks has 10 % chance to trigger. 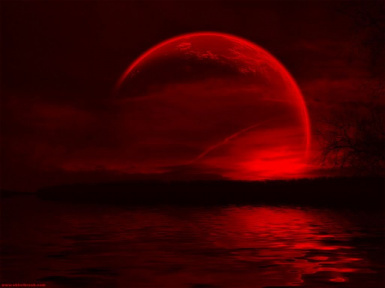 ""Blood Moon" or sometimes called "Hunter's Moon". Many people have believed this is an evil omen that is related to the werewolf myths and legends as the werewolves stalk their prey in the glory of Hircine. 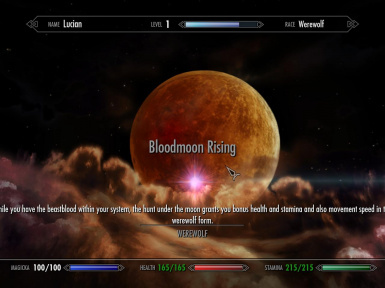 Bloodmoon Rising gives you bonuses to your werewolf and human form, increases health and movement speed during the night." 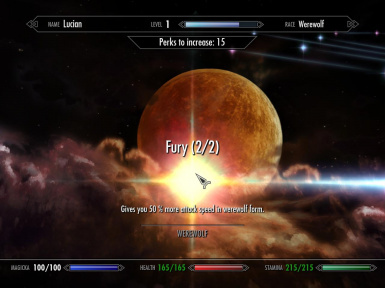 This is perk is your main ability to do alot of damage in short time to the enemies, and its designed primarly for Expert up to Legendary difficulty. "In your beast form, the hunt drives you into madded rage ignoring 20 % armor, the damage increases with each consecutive hit when enemies health is lower. Versus undead you gain 100 bonus damage and 50 % armor piercing." Max damage can be up to 280 bonus damage total! + initial Fury Swipes ability. 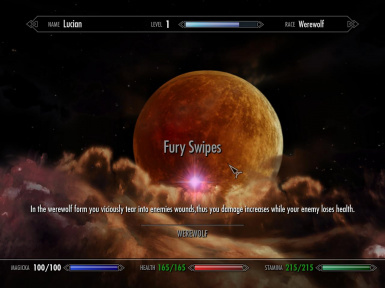 In the Lite version of the mod (when is released) it wont include Fury Swipes for balance. 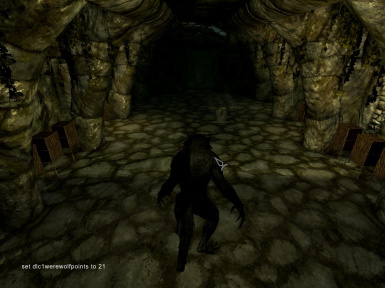 "While in sprinting in the werewolf form, the momentum of your speed causes enemies to crumble to their feet." Sprint to your enemy and they will fly away (same as Unreleting Force). "Your claws are now sharp and deadly." "Further hunting under the moons, your claws are more sharper and deadlier than before." "Your claws are now sharp as the edge of Hircine's Spear, this rich boon by Hircine has empowered you for future hunts." "GORGING: instead of 100 hp heal while devouring your prey, youre healing by total of 400. Beastial Strength Lvl 4: Adds Sweep Attack. Magic Resistence 10 (lv 10)-max 60 (lvl 50), bonus to health and stamina and minor damage resistance's." Dawnguard required, 1.9 TES 5:S patch required! 1. Extract contents of the archive to the Skyrim installation folder. 2. Eneble the esp in the launcher. Obviously all mod users, thanks guys and girls without you the updating of the mod would be pointless! Thank you so much for support, endorsing the mod and giving me inspiration to continiue working on it.